Zendesk is a suite of customer support apps that helps transform your customer service into agents for customer retention and lead source. It has one of the most flexible plan structures, making it ideal for business of any size. It consists of customer experience, support, chat, call center solution and knowledge base modules that you can upgrade separately. Zendesk’s customer experience management (CEM) solution is primarily designed to enhance communication between companies and their clients. Backed by Zendesk’s efficiency in customer support, this platform results in business-customer relationships that are richer, very personal, and worthwhile. The Zendesk CEM helps provide the expertise of functioning as your team’s extension, which guarantees that its solutions make a significant effect on your operations. With this expert support, you can create a seamless experience for your clients. Zendesk also gives you the option to set up a call center with web, mobile and messaging channels. This is ideal for highly engaged customers or prospects; your agents can quickly connect to them via an automated trigger. Through the integrated live chat, your agents can also proactively engage customers on your website or e-commerce page. You can also use analytics here to make sense of the conversations collected by your call center. 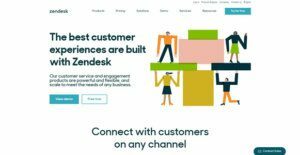 The Zendesk Customer Experience Management platform provides an efficient mix of comprehensive product knowledge and extensive customer service expertise to assist you in delivering a customer experience that sets you apart from the competition. From an effective program execution to a 24/7 customer service, Zendesk CEM ensures that you only get the best service so that you can give the same to your clients. Zendesk believes that without any deep understanding no trues relationship can be built. This is why its customer engagement platform creates and utilizes key support information to constantly enhance its awareness of its clients and build meaningful customer support programs. Through a CEM solution that is designed to understand your clients’ preferences, Zendesk is able to provide creative and innovative approaches in every stage of your customer’s journey. Zendesk is more than just a help desk. It crosses over to CRM because it allows you to organize processes, workflows and tracking of customer engagement. On its own the software can turn your huge volumes of support data into a treasure trove of leads, opportunities and market insights. Zendesk helps you consolidate these data and leverage them to build or nurture long-term relationships with your customers. If you are interested in Zendesk it may also be a good idea to check out other subcategories of Best Customer Experience Management Software gathered in our base of SaaS software reviews. There are trendy and widely used systems in each software category. But are they essentially the best fit for your organization’s specific needs? A popular software product may have thousands of customers, but does it provide what you require? For this reason, do not blindly invest in popular systems. Read at least a few Zendesk reviews and think about the aspects that you want in the software such as the fees, main functionality, available integrations etc. Then, shortlist a few apps that fit your wants. Check out the free trials of these platforms, read online comments, get information from the maker, and do your investigation thoroughly. This exhaustive research is certain to assist you choose the finest software platform for your company’s specific requirements. We realize that when you make a decision to buy Customer Experience Management Software it’s important not only to see how experts evaluate it in their reviews, but also to find out if the real people and companies that buy it are actually satisfied with the product. That’s why we’ve created our behavior-based Customer Satisfaction Algorithm™ that gathers customer reviews, comments and Zendesk reviews across a wide range of social media sites. The data is then presented in an easy to digest form showing how many people had positive and negative experience with Zendesk. With that information at hand you should be equipped to make an informed buying decision that you won’t regret.